Thunderbolt MacBook Pro hardware will support dual external displays daisy-chained by compatible Thunderbolt hardware, according to an image that popped up on Apple’s website. This suggests the possibility that upcoming MacBook Air refresh may support the same feature. This image comes from a recent post on MacRumors, where they noted that Apple accidentally leaked a new Thunderbolt LED display by posting images to Apple.com prior to an official launch. That is obviously a blunder on Apple’s part, but I found the daisy-chaining of Thunderbolt displays much more interesting than the fact that a new Cinema Display is coming out soon. MacRumors also points out that with current MBP models, only the 15″ and 17″ would support this ability, but hopefully refreshed MacBook Air’s will too. I think the MacBook Air will get Intel 3000 GPU, so they would also not support this just for the same reason the 13″ Pro does not. Can the iMac 27/21.5 inch do this aswell? 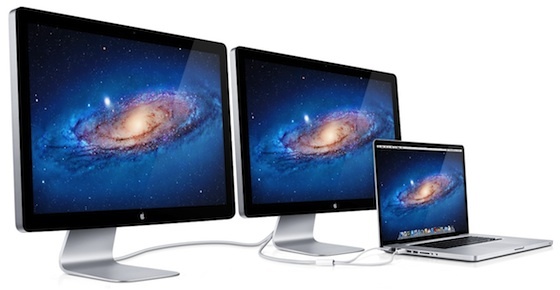 I don’t get it…one of the monitors will be plugged into the mini display port and the other into thunderbolt? Or are both of them using thunderbolt? And if so, then can we technically hook up three screens? It’s called a Daisy chain. Macbook Pro -> Display 1 -> Display 2. The displays will have two Thunderbolt ports. The displays will NOT have two Thunderbolt ports. Apple displays have a cord coming out of them. And then one Thunderbolt port to continue the daisy chain. Maximum two displays on the chain. Second display will only work with Macs with a discrete graphics chip. I’m guessing no. Only 2 displays. Do all MBP have discrete graphics chip? I believe NO Macbook Air do. And only ONE of the mac minis. So if I have the 17″ mbp with thunderbolt input would it be possible to chain a third monitor? To me it seems doable. I was just getting read to make this leap of Apple faith, and was glad to see what you were able to share. Many Thanks from Minneapolis by a wedding photographer! 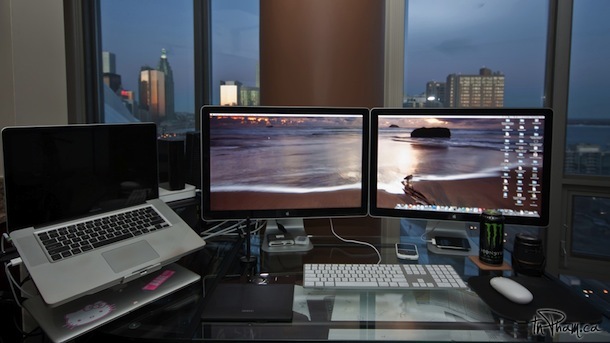 With a view like that, why would you want two monitors?